Airport screening in the UK does not improve security and inconveniences passengers, the International Air Transport Association's head has said. The world body's Giovanni Bisignani said limiting passengers to one piece of hand luggage benefited only airport operator BAA. But BAA, which does not operate all UK airports, said the luggage policy had been introduced by the government. The government said the measure was a response to a "very real threat". Announcing half-year, global airline passenger figures, Mr Bisignani called for harmonised security measures across the world's airports, saying they were "more critical than ever". "The US-EU agreement on the sharing of passenger data, signed this month, was a step in the right direction," he said. "But governments must focus much more on further harmonisation to ensure that effective security is also convenient for passengers. "A particular focus will be the UK, where unique screening policies inconvenience passengers with no improvement in security. "The only beneficiary is the airport operator BAA that continues to deliver embarrassingly low service levels by failing to invest in appropriate equipment and staff to meet demand. This must stop." A spokesman for the IATA said Mr Bisignani was referring to the British regulation limiting passengers to only one piece of hand luggage. He said the UK was the only country in the world to introduce the restriction. A spokesman for BAA, which runs seven airports including Gatwick and Heathrow, was quoted by the AFP news agency as saying the company had spent £20m on 22 more security lanes and on recruiting 1,400 staff since last August. He added: "We've made significant efforts... to reduce the queuing times and to improve the performances of our airports." 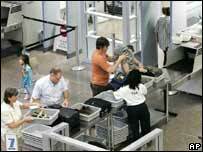 The one-baggage limit was introduced by the government in the wake of last August's airport terror alert. A spokesman for the Department for Transport said: "The government has already launched a £1.5m advertising campaign in the national press to remind passengers to arrive prepared and, where possible, is introducing changes to help make the security process quicker. The IATA said international air traffic passenger demand grew 6.3% in the first half of the year compared with the first half of 2006. However, passenger demand growth weakened to 5.3% for the month of June, the lowest growth rate in nine months, although the IATA predicted record numbers of people would travel this month. The association multiplies the numbers of passengers carried by the number of kilometres they travel to determine demand.